This is the first newsletter from the Imaginaries Lab at Carnegie Mellon, and the third in a series/saga covering the development of the Design with Intent book (of which more below). My aim is for the Lab to do a newsletter once every quarter, or at least three per year, which is (I hope) relatively realistic and achievable (they won’t all be as long as this). 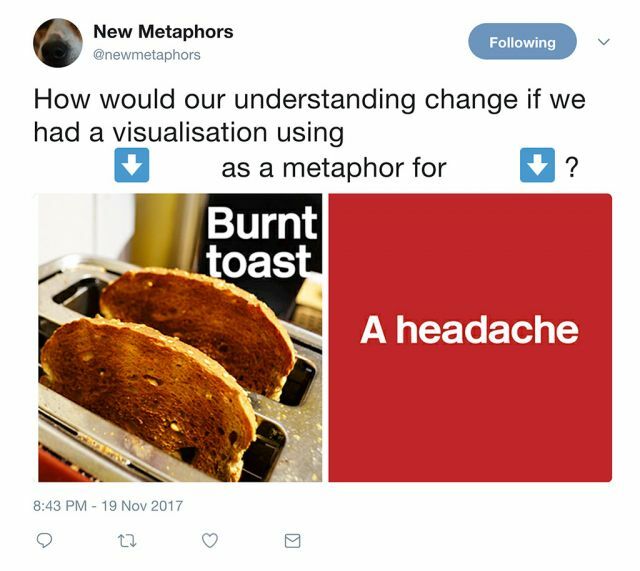 Can creating new metaphors help us design new kinds of interfaces, and understand the world differently? Building on versions of that we’ve run in the last few months at Google SPAN (see below), the Universidad del Desarrollo in Chile, and with MDes students at Carnegie Mellon, the workshop will be about designing new kinds of more qualitative interfaces and visualisations, through exploring and creating novel metaphors and analogical links between ideas and phenomena in the world—cross-pollination between art and technology, human experience and interaction design. We’ll use a process of metaphor generation inspired by Gregory Bateson’s “syllogism in grass”, a poetic approach to logic, to generate ideas for different kinds of interface, and then mock up these interfaces to enable a critical reflection on how they might help us understand the world differently, through making hidden relationships and qualities more experiential and expressable in new ways. The early bird tickets have sold out, but there are still places remaining for the workshop at €175 per person. So, what is the Imaginaries Lab? Back in August, I wrote a short article outlining some of the initial thoughts that led to the Imaginaries Lab, and the scope of what we’re doing and planning to do. We’re a new (January 2017–date) research and teaching group at Carnegie Mellon University, housed within the School of Design, using design methods to explore and support people’s ‘imagining’ — both new ways to understand, and new ways to live. That’s a very broad way of looking at things, but it essentially builds on what I found to be the most interesting parts of all the work I did on design for behaviour change, from early work on ‘architectures of control‘ (2004–5) through the Design with Intent toolkit, and sustainability-related projects such as CarbonCulture at DECC and SusLabNWE: how do people understand and make sense of the world around them, and what they can do, now and in the future? And how does the design of the systems and technologies around us relate to that? In a world where we are not just dealing with increasing complexity of the use of data, the development and application of artificial intelligence, and global crises, political and ecological, but are inescapably part of those systems, we are, to paraphrase Heinz von Foerster, deluded if we think we can be “observers” objectively or detachedly. We are part of this, and we need to design ways to see the systems better from the standpoints we have, and find new standpoints, to work out how we are going to do anything. At present, the Imaginaries Lab is small and mostly unfunded, with a small team of graduate student researchers working on projects which broadly fit into the new ways to understand or new ways to live categories (mostly, so far, the new ways to understand). The current team is Ashlesha Dhotey, Silvia Mata-Marin, Devika Singh, Matt Prindible, Shengzhi Wu, and myself, but we’re always happy to work with others doing interesting things. Some information on some of our current and recent research projects is below — I’ll cover some of our teaching (and the projects resulting from it) in the next newsletter. Many of you originally signed up to this newsletter to get updates on the Design with Intent book, as it’s being written. And if you look back, you’ll see the ‘expected publication date’ slipping. Well, I have to tell you: the plans have changed somewhat since the last update. O’Reilly and I have parted company, a few months ago, primarily because I failed to keep to their (very reasonable) schedule for delivering finished chapters. So, I am currently considering other — perhaps more interesting — ways to publish the book. But this shift has enabled a re-think of the book’s scope and the way it is framed. It sits somewhere between practice and academia, and although that is sometimes awkward for publishers, in a sense that’s the point of it. It will of course still include an expanded, updated, developed collection of Design with Intent patterns, incorporating what I’ve learned over the seven years since the original card deck was released. But my aim is for the surrounding material to be going beyond simplistic notions of “behaviour change”: it’s not going to tell you “here are the top X ways to change people’s behaviour” or offer another model which claims to explain everything. We are also now in a world where the potential horrors of behaviourally targeted interventions and algorithmic reaches into people’s lives and data are making a difference on a large scale, from manipulating voters to a whole range of everyday interaction design issues. The book needs to cover this. We can talk a bit about why it’s been so hard to write to schedule: alongside the research you see elsewhere in this newsletter, which is not technically allocated any time as part of my actual job at CMU, the Assistant Professor role I have involves (for now) quite a heavy teaching load, and as these are almost all new courses that I’m teaching, my preparation time each week is significant. It’s not an excuse, but it’s an explanation. Since signing the original contract for the book, I’ve moved jobs, moved house twice, moved country, acquired a dog, and taken on many other responsibilities that have all counted against spending the amount of time needed on the project. I’ve also learned much more about my own style of working, and found that a book such as this is not really something I can write a whole chapter at a time — it’s more a case of adding to, and evolving, multiple sections in parallel, which is not always what a publisher wants. Anyway, I have decided to build development of parts of the book into 51-372 Persuasion, an undergraduate course I am teaching again in Spring 2018 at Carnegie Mellon, so that there is a ‘legitimate’ reason to be working on writing it. There will be an update once this next stage of book development reaches an appropriate level: that’s the best I can tell you at this point. In September, with the help of Sarah Foley I ran New Metaphors and Qualitative Interfaces, a workshop for around 40 participants at Google Design’s SPAN conference in Pittsburgh’s Bakery Square. The conference was an intriguing convergence of some great speakers from further afield tackling difficult issues in society’s relations with technology, such as Mimi Onuoha and Sara Hendren, with a roster of CMU- and Pittsburgh-based people doing interesting work in art, design, and (both the history of, and the boundaries of contemporary) technology, including Molly Wright Steenson and Golan Levin. In our workshop, we were trying out a gradually evolving method for using “forced connections” (bisociation, in Arthur Koestler’s terms) to generate new metaphors for interface design, to enable qualities that are hard to express to be visualised or otherwise represented through new kinds of interface or display. For example, as one group proposed, using plant growth as a metaphor for overwhelmedness might suggest a form of to-do list / personal diary / productivity software based around tending to a ‘garden’ — spotting plants which are shading out others, weeding, but also enjoying the fruits of actions and the beauty of the garden. 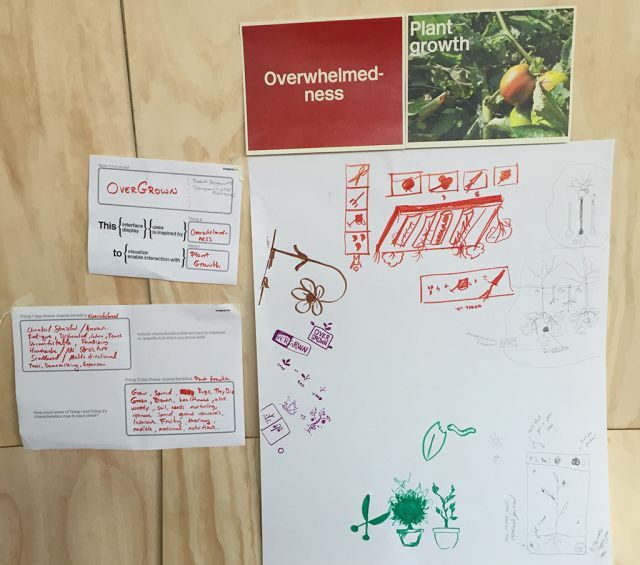 The mix of plants, growing at different rates and needing different nutrients, was felt to be in many ways a quite appropriate metaphor for managing the tasks we have more qualitatively. 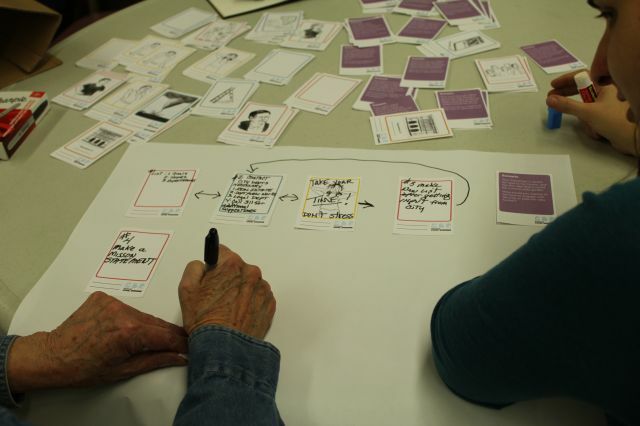 The workshop process is being evolved and developed in time for our Interaction 18 session (see above) which is much longer, with more time to explore different directions and dimensions, but if you’re interested in trying things out for yourself, you can download a draft version of the cards [big file!] and the worksheets we used. Alejandro Pantoja Sanchez’s design students at UDD in Santiago have been trying out iterations of the cards, first in June and now again in a longer project in November and December, alongside a couple of sessions with students here at Carnegie Mellon, so we are gradually getting some ideas of what works and what doesn’t, and why. What should energy sound like? Building on the Powerchord project that Flora Bowden and I carried out at the RCA, Electric Acoustic is a continuing exploration of sonification — turning data into sound — as a form of interface for energy use. Shengzhi Wu, Devika Singh and I ran a booth at the Pittsburgh Maker Faire in October at which visitors could ‘sketch’ sounds (using Leap Motion controllers) representing the (assumed) power being used by a range of household activities, partly as a demonstration of sonification and partly to explore some questions around the dimensions of sound which people associate with different kinds of energy use. For example, should higher pitch correspond to higher instantaneous power use? That sounds intuitive, but when actually exploring different sounds, many people (myself included) seem to feel that lower pitched, deeper sounds ‘fit’ higher energy use better, with higher pitched sounds more suited for lower power use (think of parallels with smaller animals making higher pitched squeaks, and bigger animals having deeper roars). 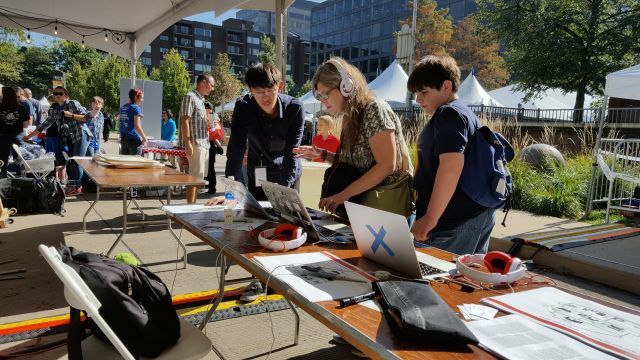 This story by Katie Herzog explains further some of what we did at the Maker Faire — we were awarded two Maker of Merit blue ribbons, which was a nice surprise. 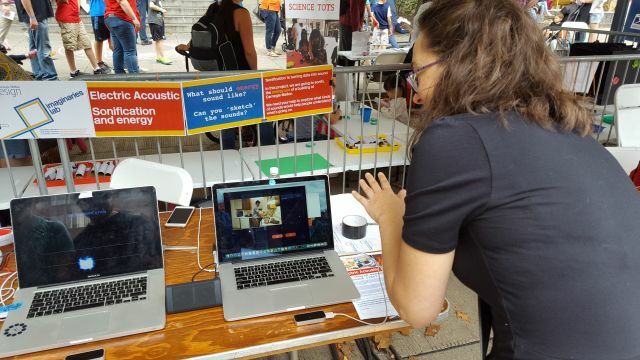 The goal of Electric Acoustic is to build an installation which sonifies the energy use of a building at Carnegie Mellon in near-real time, so that visitors can hear (and possibly see in augmented reality, inspired by some examples Zach Lieberman created) the power being used in different ways. We are about to get access to be able to explore the energy data being monitored already (thanks to CMU’s Facilities Management Services), so we’ll see (and hear) what forms of sonification might be possible and most effective. 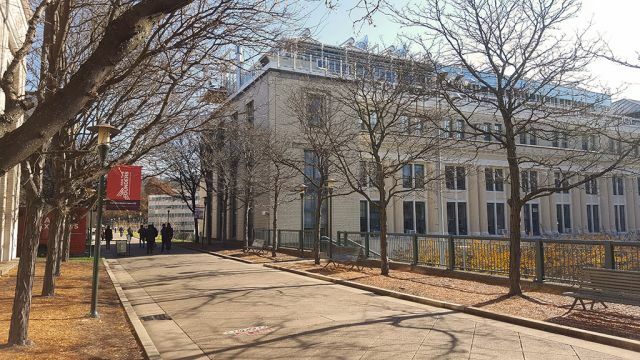 The aim is for the installation to be ready by the spring; the project has received a Carnegie Mellon College of Fine Arts Fund for Research & Creativity grant, which should enable us to develop it to a higher standard. How do you imagine local government? What does “The City” or “The Council” look like, in your mind’s eye? Where would you start if you wanted to change something in your neighbourhood, to suggest ideas, or to understand how decisions are made? Local government affects all of us, but it is complex and often fragmented, and different parts and layers are often understood differently by different people and communities, with effects on how much we feel we have the ability to participate. “People have no mental model of government”, as Leisa Reichelt put it. The world we experience, both physical and political, is the result of compounded layers of decisions taken at different times by real people. If we all had a better way into the system, would we be more engaged with it? 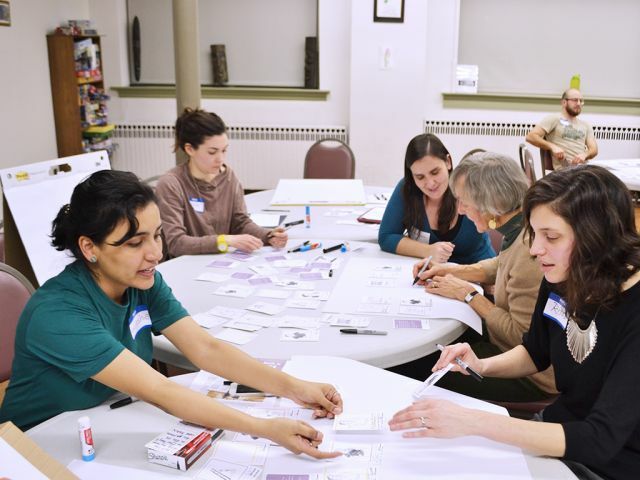 Some of the Civic Visions work builds on ideas I started to explore with Laboratorio para la Ciudad, Future Cities Catapult, Superflux and other partners last year in the Legible Policy project in Mexico City, but we’re taking a more practical stance in Pittsburgh. 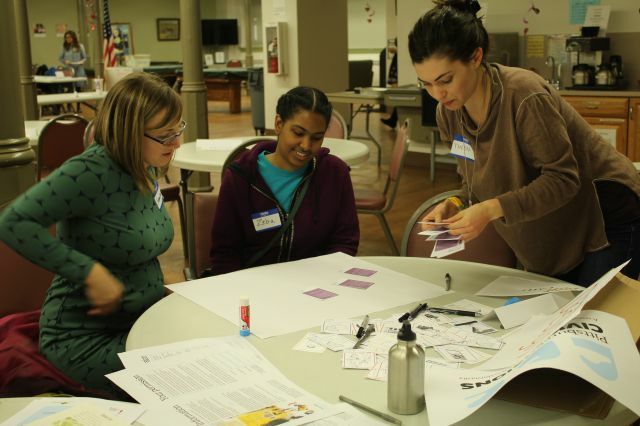 Since early 2017, the Imaginaries Lab has been running a series of small engagements in Pittsburgh using creative research methods (from service design and user experience design practice) to explore how people think about, understand, and relate to local government —how it works, what it does, and how to interact with it — and people’s visions and ideas for how engaging with and participating in local government could be different in the future (new ways to live). At the invitation of the City of Pittsburgh’s Department of Innovation and Performance, our first session, with Theora Kvitka, Ashlesha Dhotey and Silvia Mata-Marin, was at a Love Your (Resilient) Block event (part of Pittsburgh’s role in the 100 Resilient Cities and Cities of Service initiatives) — Theora has a good write-up here. 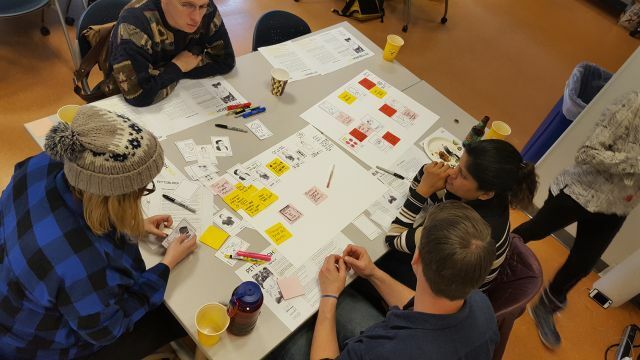 We followed this with Pittsburghing, a workshop at CMU where Nehal Vora also joined the team. 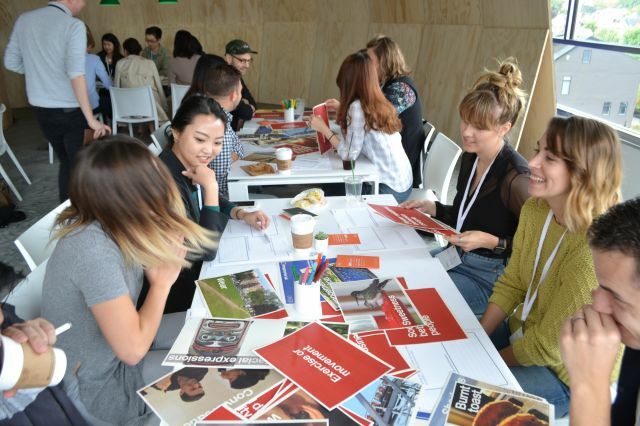 Graduate students from Design and Public Policy gave their take on these issues, and ideas for service redesign, as people who had (mostly) recently moved to the city. This semester, Matt Prindible, Ashlesha, Silvia, and I have been designing and planning a larger study situated in the space of the city, and its diverse neighbourhoods themselves — how does government touch you through infrastructure, through regulation, through the ways you live? How do you experience it, and how do you imagine it? We’re in the process of organising the next stage of the work at present. 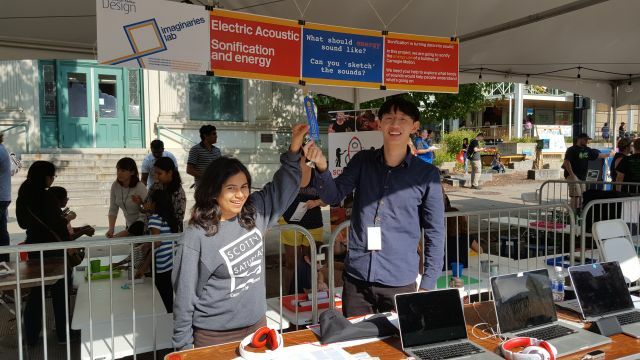 Matt Prindible, Devika Singh, and Shengzhi Wu joined the Imaginaries Lab as graduate research assistants this semester, working on the Civic Visions and Electric Acoustic projects. Nazlı Terzioğlu passed her PhD in May, which I co-supervised at the RCA with Clare Brass of Department 22. Nazlı’s thesis, Do-Fix: Creating Deeper Relationships Between Users and Products Through Visible Repair, reimagines the repair of products as something to make intentionally visible, distinctive and even beautiful. Earlier this month, Nazlı was part of a panel at the PLATE 2017 circular economy conference at TU Delft. Chang Hee Lee, whom I’m supervising at the RCA with John Stevens, presented his PhD work at the American Synesthesia Association conference at Harvard in October. The video of Chang’s talk includes an intriguing new project, Silent Scene. A couple of years ago, Mark Whitehead of Aberystwyth University interviewed me for his book Neuroliberalism: Behavioural Government in the Twenty-First Century, written with Rhys Jones,‎ Rachel Lilley,‎ Jessica Pykett,‎ and Rachel Howell. The book’s now been published, and is a fascinating look at the ways in which behavioural insights have become entangled with neoliberal politics to influence policy, and the ethical and social implications of this partial ‘capture’. There is a thoughtful chapter covering design in relation to these ideas, in which parts of my rambling interview are quoted, and I’m described as a cognitive designer, which sounds good on some levels but then also horrifies me. With Ingrid Mulder (TU Delft) and Joanna Boehnert (University of Surrey), I’m chairing a track at the Design Research Society 2018 conference in Limerick, Ireland, on ‘Designing for Transitions’. We’re aiming to take a slightly broader look at Transition Design, considering emerging approaches to design research at the intersection of sustainable design and sociotechnical systems. While the call for papers has now closed (and we are reading, with interest, the papers people have submitted), the DRS conference is still open for submissions of Conversations and Workshop proposals. I’m on the Conversations committee and am looking forward to the diversity of proposals. It’s been a busy year, with (work-related) trips to Ithaca, Chicago, and Denver in the US, Oslo in Norway, Santiago and Concepción in Chile, and Wellington and Auckland in New Zealand. Here are some of the (academic) places our work’s been published over the last few months. In the year ahead we need to prioritise some higher-profile non-academic venues as well as the academic ones (and probably concentrate on some journal articles rather than book chapters, not because I don’t value them, but because the books they are in are almost without exception completely inaccessibly priced). Thoughts around this topic have evolved somewhat since the paper (see the discussion of new metaphors above). Last month, Ty Van de Zande, who was a Summer Undergraduate Research Fellow with the Imaginaries Lab, presented his Printerface project at the ACM’s ISS conference on Interactive Surfaces and Spaces in Brighton. Printerface is a new type of control/display interface using icons screen-printed with electroluminescent and conductive inks. Ty’s demo controls a music player, but there are many other potential applications in new kinds of interface design. Lockton, D. and Candy, S. (forthcoming) ‘A Vocabulary for Visions in Designing for Transition’. Cuadernos del Centro de Estudios de Diseño y Comunicación. I have two chapters in Kristina Niedderer, Stephen Clune, and Geke Ludden’s new book, Design for Behaviour Change: Theories and practices of designing for change, in Routledge’s Design for Social Responsibility series. Please email me if you’d like a copy of either chapter, as I’ll have to scan it out of the physical book. Lockton, D. (2017). 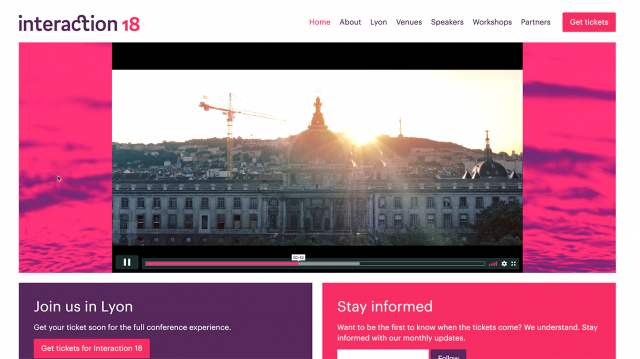 ‘Design, Behaviour Change, and the Design with Intent Toolkit’. In: Niedderer, K., Clune, S.J., Ludden, G. (Eds. 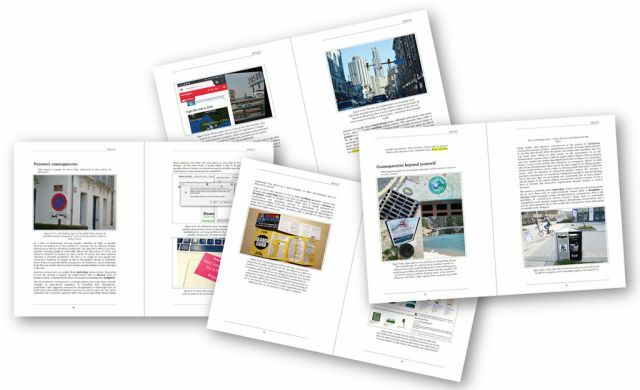 ), Design for Behaviour Change: Theories and practices of designing for change. London: Routledge.